Thirteen graduates have received 2006 College Honored Alumni Awards. 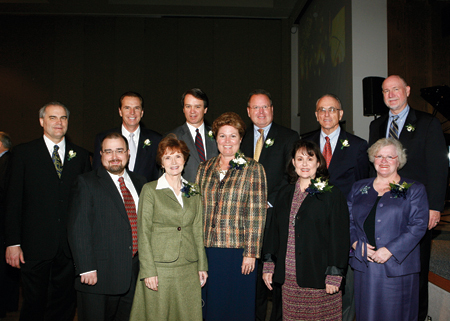 They were honored during Homecoming 2006 and shared their expertise through college lectures. For 35 years Albert Frances Bahr (BS ’38) of Orem, Utah, served as a U.S. Soil Conservation Service specialist in North Dakota. Always supportive of BYU, he donated his personal soil-science library and conservation slides to the university, and he and his wife endowed a scholarship for science majors studying plants and animals. Joseph K. Torgesen (BS ’68) of Tallahassee, Fla., has had a distinguished career at Florida State University, where as a psychology professor he has led two major divisions in the Psychology Department and founded the Florida Center for Reading Research. In 2003 President George W. Bush appointed Torgesen to the National Board of Education Sciences. Douglas R. (BS ’78) and Nancy Patton Ferrell (BS ’80) of Glendora, Calif., specialize in the design of recreational water features. Through their company, Patrell Environmental Engineering, they design swimming pools, water features, water parks, and theme-park elements. When Utah hosted the 2002 Winter Olympics, a key person in the games’ success was Fraser Bullock (BA ’78) of Alpine, Utah. Bullock, who served as COO, CFO, and eventually CEO of the Salt Lake Organizing Committee, was instrumental in balancing a $1.31 billion budget and turning a $400 million deficit into a $100 million profit. Emmy winner Sam Cardon (BA ’93) of Orem, Utah, is a versatile composer whose credits include more than 30 film scores, four full-scale musicals, chart-topping jazz recordings, network-television themes, and music for two Olympic broadcasts. He has provided scores for The Work and the Glory trilogy and 12 IMAX films. The arts in Oklahoma have been significantly enhanced through the efforts of Jamie Duncan Jacobson (BA ’77) of Edmond, Okla. The 20-year director of dance at the University of Central Oklahoma, Jacobsen received the Oklahoma Governor’s Arts Award for her extensive contributions to dance. Athelia Tanner Woolley (BA ’68) of Holladay, Utah, a former college valedictorian, has distinguished herself as a mother, Church leader, business associate, and writer. Additionally, she volunteers as a hospice worker and juvenile-court mediator. She has also served for five years on the Primary General Board of the Church of Jesus Christ. Linda Goold (BA ’68) of Bethesda, Md., has worked as a tax law and policy specialist in government and private practice and has served as an industry advocate. Her current position puts her before Congress, the IRS, and the U.S. Treasury as the tax counsel for the National Association of Realtors. James W. Parkinson (BS ’73) of Palm Desert, Calif., has contributed to the J. Reuben Clark Law School through years of consistent vision, commitment, and leadership. His programs to enhance the student experience have included founding the Orrin G. Hatch Distinguished Trial Lawyer Series and constructing a plan for a trial-advocacy institute. Douglas Reed Maughan (BS ’79), of Fullerton, Calif., a partner at PricewaterhouseCoopers, is a noted mergers and acquisitions tax leader in Southern California. He generously supports his alma mater through the Marriott School, where, among other roles, he has chaired the School of Accounting’s board of advisors. Carol A. Bush (BS ’65) of Salt Lake City selected a nursing career because of her desire to help others, which she has done both as a practitioner and a leader. She has been corporate nursing director for Intermountain Health Care and president of the Utah Organization of Nurse Executives. Entrepreneur Dallan W. Quass (BS ’86) of Elk Ridge, Utah, has established the Foundation for On-Line Genealogy. He hopes his free Web site, WeRelate.org, will help people search for their ancestors and share what they know about their personal heritage with others.